Please note: This article only applies to FME Server 2014 and earlier. When you submit a job to the FME Server Data Download Service no zip file is created. This occurs when using asynchronous mode - the mode used for email notification. The data is not being written to the automatically generated unique directory. This directory is typically something like "C:\ProgramData\Safe Software\FME Server\DefaultResults\FME_4F366F63_1437683309563_2288", but it can be located elsewhere depending on settings. In this case the email may even not be sent. 1. 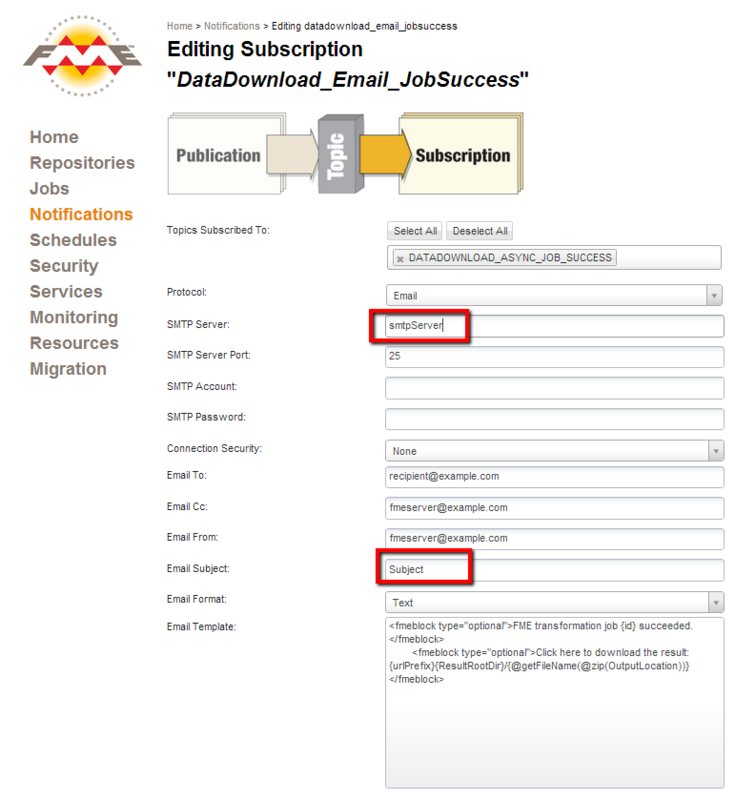 The Subscription DataDownload_Email_JobSuccess must be filled in with values for SMTP Server and Email Subject. If you do not want FME Server to actually send an email you can just enter dummy values for these parameters. To edit the Subscription got to the FME Server WebUI as an administrator and then click the Notifications Tab and then the Subscriptions tab. Click on DataDownload_Email_JobSuccess to edit it and enter either real values is you want to send emails or dummy values if you do not. include the email address when using the Data Download Service in asynchronous mode by including the parameter opt_requesteremail=<EmailAddress> in either GET or POST requests. 3. The FME_TEMP environment variable may be set to a non-existent or non-writable path. Please see FME TEMP environment variable for more details on how to change or unset it.